Gazing at this carefully organized menagerie surrounded by creatures of all sorts and softly, scrolling vines, this wallpaper entices our eyes to flit from scene to scene. In one section, we notice a spider looming next to a small girl and in the next a mischievous cat plays a fiddle. As this continues, we slowly come to realize the subtle (and not so subtle) nods to popular nursery rhymes embedded into this paper. 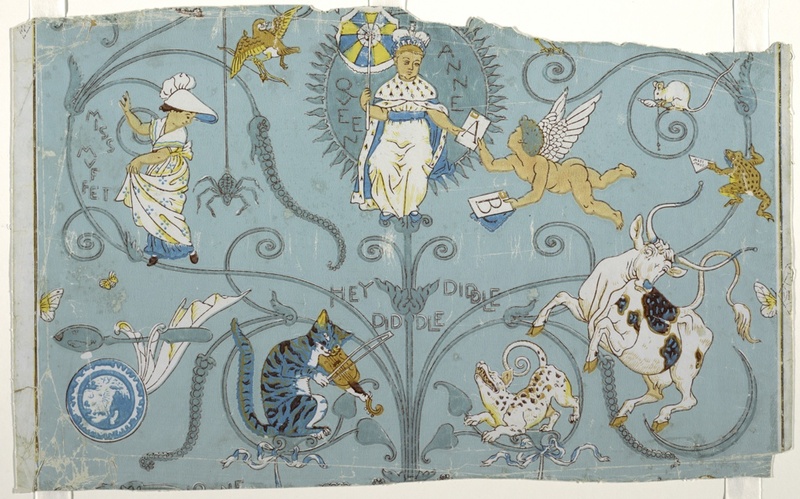 Possibly as a device for children, small phrases are also included in the wallpaper, right by the cat is the phrase “Hey Diddle Diddle”, prompting the viewer to conjure up the rest of the song. While this paper unfortunately does not show a full repeat, it is easy to imagine a children’s room or nursery where its jovial images delight those inside. Walter Crane, the designer of this paper, was an English artist who was born in August 1845 and died in March 1915. He was best known as an illustrator of children’s books but tried his hand at many artistic genres including painting and wallpaper design. Being a prominent socialist, Crane produced illustrations that embodied his political ideals as an artist-craftsman and as a proponent of fair labor. As a designer steeped in the ideals of the Arts and Crafts Movement, his wallpapers are often likened to those by William Morris; as seen here, they are typically characterized by their flat, stylized motifs and bright blocks of color. Additionally, manufacturers who printed Crane’s papers sometimes found him difficult to work with, as he often submitted unfinished works or designs that were too elaborate for machines of the time to print cheaply. Emily Ewen is a graduate student in the History of Design and Curatorial Studies program offered jointly by the Parsons School of Design and the Cooper Hewitt, Smithsonian Design Museum. She is a Fellow in the museum’s Wallcoverings Department. Hoskins, Lesley. The Papered Wall: The History, Patterns and Techniques of Wallpaper. London: Thames & Hudson, 2005.